2018 RAM 1500 LOW MILES !! ONE OWNER !!! Trim:LOW MILES !! ONE OWNER !!! 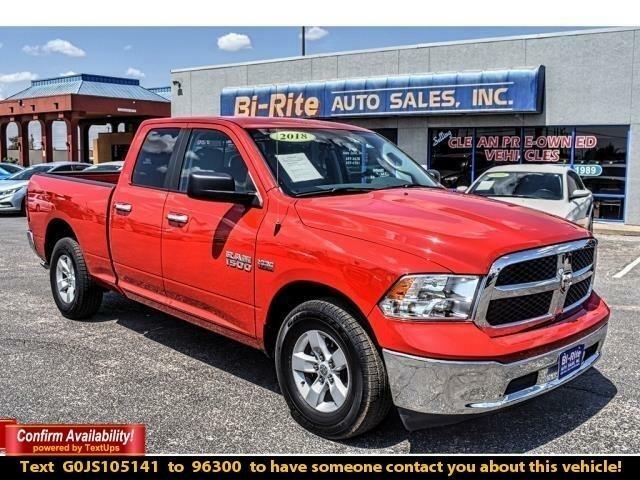 Built to dominate the road is easily seen in our 2018 RAM 1500 SLT Quad Cab 4x2 brought to you in Bright Red! Powered by a proven 5.7 Liter HEMI V8 that offers 395hp while connected to an innovative 8 Speed Automatic transmission for impressive passing and towing. Legendary performance and capability are close at hand with this Rear Wheel Drive then you get behind the wheel and take in the near 21mpg. No one can ignore the bold design, aggressive wheels, and distinct grille of our SLT. With plenty of room for your gear and your friends, our SLT is ultra-comfortable and innovative. It's designed to help you take on your day with ease. All of your important information comes along for the ride thanks to the Uconnect, hands-free communication with Bluetooth streaming audio, a backup camera, available satellite radio, and more. Our robust RAM truck has undergone extensive safety testing and is well-equipped with dynamic crumple zones, side-impact door beams, and an advanced airbag system. The epitome of a workhorse, our SLT has you covered with the ideal blend of muscle, capability, security, and comfort! Print this page and call us Now... We Know You Will Enjoy Your Test Drive Towards Ownership! Please call us for more information. Vehicle Inquiry for 2018 RAM 1500 LOW MILES !! ONE OWNER !!! Trim: LOW MILES !! ONE OWNER !! !